Background Benign prostatic hyperplasia (BPH) is one of the most common diseases in age group above 50 years. Symptoms relating to urination are usually frequency, urgency, and hesitancy and vary from case to case. Very few studies are reported on homoeopathic treatment of BPH. Hence, an evidence-based observational study on five patients of BPH was done using homoeopathic medicines. The objective of this case series is to assess the usefulness of individualised homoeopathic medicines in the treatment of cases of BPH. 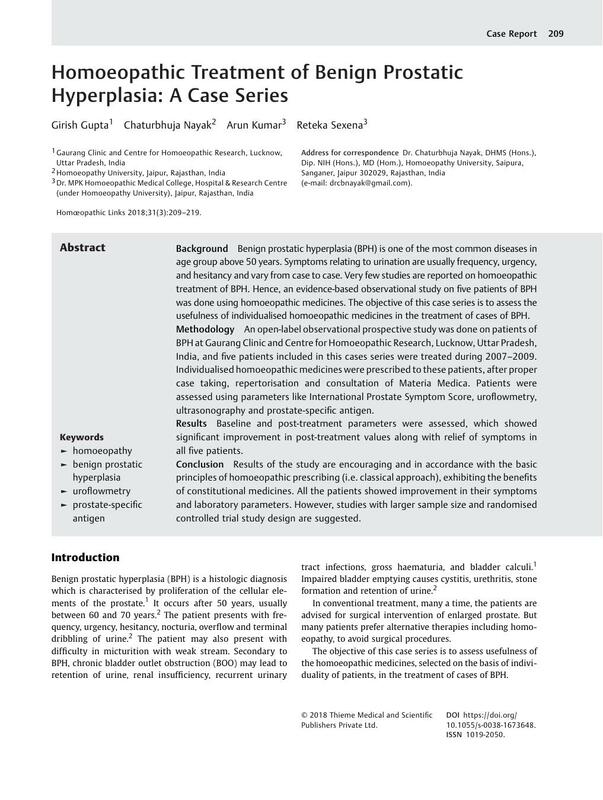 Methodology An open-label observational prospective study was done on patients of BPH at Gaurang Clinic and Centre for Homoeopathic Research, Lucknow, Uttar Pradesh, India, and five patients included in this cases series were treated during 2007–2009. Individualised homoeopathic medicines were prescribed to these patients, after proper case taking, repertorisation and consultation of Materia Medica. Patients were assessed using parameters like International Prostate Symptom Score, uroflowmetry, ultrasonography and prostate-specific antigen. Results Baseline and post-treatment parameters were assessed, which showed significant improvement in post-treatment values along with relief of symptoms in all five patients. Conclusion Results of the study are encouraging and in accordance with the basic principles of homoeopathic prescribing (i.e. classical approach), exhibiting the benefits of constitutional medicines. All the patients showed improvement in their symptoms and laboratory parameters. However, studies with larger sample size and randomised controlled trial study design are suggested.